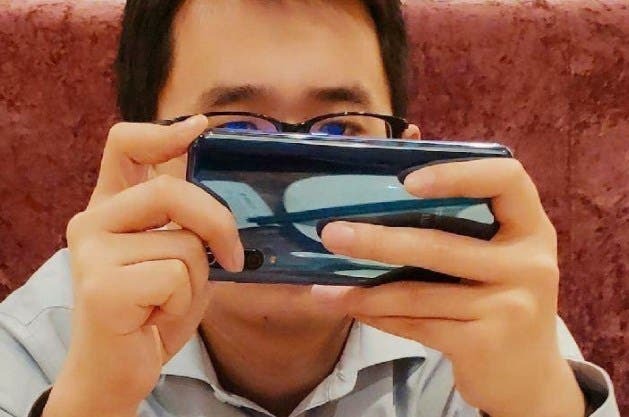 A few hours ago, Wang Teng, Xiaomi’s Product Director released a photo showcasing the alleged Xiaomi Mi 9. But it was quickly deleted. However, there were some nimble users managed to save it. As shown in the photo below, the spy photo reveals some important information concerning the upcoming model. If this smartphone is the Xiaomi Mi 9, it means that the next-gen annual flagship of the company will continue to use a vertically arranged rear camera like the Xiaomi Mi 8. On the bottom area, there is still the Mi logo, while there is not rear-mounted fingerprint identification module. Thus, most likely, the rumors as this handset will be using an on-screen fingerprint recognition technology are true. Moreover, the back camera area seems to sport a total of three sensors. Previously, Wang Teng released a photo sample of a suspected Xiaomi phone with 5 camera sensors. The watermark in the lower left corner of the picture carries an eye-catching phrase of ‘SHOT ON AI PENTA CAM’. So there have been some assumptions one of the forthcoming Xiaomi flagships will sport a camera with five sensors. As for now, seems the Xiaomi Mi 9 is not that model. On the other hand, some users think if there are two camera sensors on the front and three lenses on the back, then this could refer to the Mi 9. Previously, Xiaomi has been announcing its annual flagships in the first three months of the year and launching it a few months later. As for the Xiaomi Mi 9, it is expected to hit the market as soon as in April or May or even June. Now when Redmi is an independent brand, customers have more expectations from the next-gen Xiaomi flagship.